This is the 100th. Blog I have written since I started in November 2005; it is fitting that it should be on a happy note. 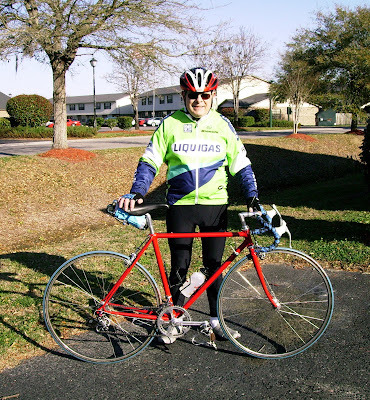 Today I went for a modest ten-mile ride on my re-assembled bike, just 93 days after my accident last December. I might have gone a little further but it was extremely windy and I didn’t want to over-do it on my first ride. There was one set back during re-assembly; I switched handlebar stems from 11 cm. to a 9 cm. In doing so, I noticed my handlebars were bent from the accident; I had failed to notice it before. As you can see from the picture, (Left) the right side, nearest the camera, is pushed back and the bottom of the drops are no longer parallel. It was no wonder that my right hand was so badly bruised in the accident. My hand was on the brake hood at the time I hit the side of the SUV. The impact through my hand was enough to twist the handlebars. I realized finding a replacement handlebar would delay the re-build for at least a week, even two. Initially this was a huge disappointment, then I decided to go ahead and as a purely temporary measure make do with the damaged bar. My first few rides are going to be very gentle, close to home, and I won’t be putting a lot of stress on the handlebars. In the mean time I am now on the look out for a pair of Cinelli “Giro de Italia” 24 - 40 or similar. 26.4 ferrule. This frame being a centimeter smaller than my previous one, my stem is a centimeter lower, but I now have 2 cm. 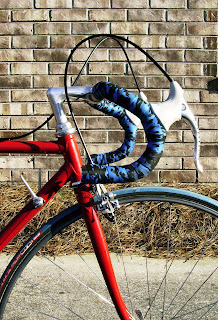 shorter reach due to switching to a shorter stem. The position felt comfortable this morning when I rode, I had felt a little stretched on my other bike. I had previously set the bike up the same as I had it since the 1970s. I have come to realize that I have to make concessions for a body that is not as young and supple as it once was. Nice to see you are riding again. Welcome back to a life of ride! I was about to write something about feeling the wind in your hair, but I'd rather you wear that helmet. Tight. Chase down a Rex for me, Dave! Great to see that you are back out there Dave. I will try to send some pics of both my road and track bikes for the website if you want. By the way read the book and it was great!! !